For online furniture retailers, branding is more critical now than ever before. Why? There are a couple reasons. First, according to Forbes, e-commerce furniture sales are expected to reach $32 billion by 2018. As the market expands, new furniture retailers will surely be entering the fray looking to cash in. This means it will be more challenging to stand out in a rapidly growing crowd. Second, Forbes also quotes the Consumer Buying Trends Survey conducted by Furniture Today, which shows that millennials are now the largest consumer group in the U.S. furniture market. Millennials are notoriously hard for brands to win over, so staying top-of-mind with them is crucial to your success. Your company has likely spent significant time, effort, and capital to develop and refine a strong, polished, recognizable brand that reflects who you are as an organization and draws attention to your offerings. Unfortunately, without ongoing support, today’s “go to” brand can quickly fall out of favor. Miss out on an opportunity to reinforce your status as a market leader, and you may find your products and your company being relegated to “irrelevant” status. Branding your furniture shipments is one of those opportunities. Proudly displaying your logo, tagline, and color palette, both on the outside and the inside of a shipping carton, makes a bold statement about your pride in your products that will instill confidence in your customers…and maybe a bit of fear in your competitors. Use water-activated tape (WAT) branded with your logo or tagline. Not only is WAT exceptionally strong and cost-effective as a one-strip sealing solution, it can be printed with anything you feel will be informative or engaging to recipients. Use the color scheme from the visual identity you’ve established in your packaging. Everything from cartons to packing materials can take on your signature hue. Ship in boxes customized with your branding and sealed with WAT printed with promotional material. Entice recipients to make a future purchase with WAT that touts special offers. Incentives only available to existing customers (like the recipient) can produce a feeling of exclusivity that serves as an even more powerful motivator. Ensure that stickers and tags reflect your brand. Items adhered to the carton or the product itself should reflect your brand through colors, images, or text. Include branded flyers and other promotional materials in the carton. Not only are they another visual reminder of your company, the satisfied recipient may share them with friends and family, thereby extending your reach to additional potential customers. Use on-brand stretch film. 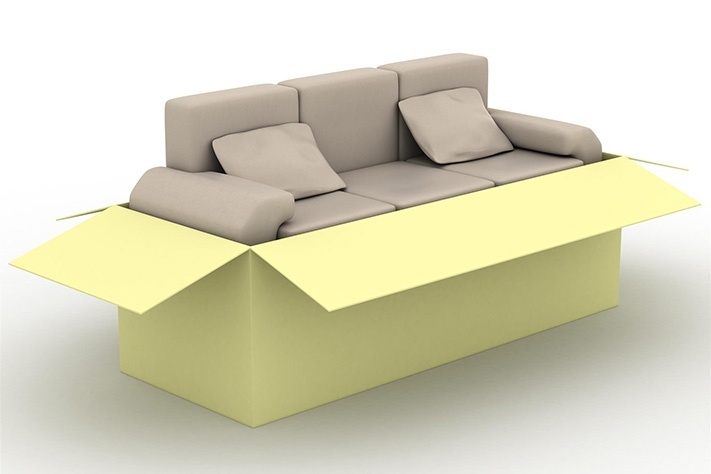 If you wrap items—to hold cushions in place on chairs or sofas, for example—consider using custom-colored plastic film. It works just like transparent film but continues the color theme you’ve established on the outside of the carton. Whatever strategy or strategies you use, you are helping to create a buzz around your products. In addition to using branded packaging for shipping your products, below are some other helpful tips for ensuring your merchandise arrives undamaged. Pack in strong, lightweight corrugated cartons. Use custom foam inserts designed specifically for the item. Not only will this provide optimal protection, it can increase packing efficiency. Remove doors, legs, and other fragile components and wrap them securely. Use multiple cartons if necessary. If including all an item’s components in one carton makes that carton especially heavy and hard to handle, you are better off shipping in multiple cartons. Give cartons the rattle test. After you have packed an item, give the carton a series of progressively more vigorous shakes. It at any point it starts to rattle, open it up and make padding modifications as needed. The additional work is much better than having to deal with broken merchandise and an unhappy customer. If you have questions about our water-activated tape and how it can be printed with your branding or would like to know more about our water-activated tape dispensers and other products, please contact us at your convenience.